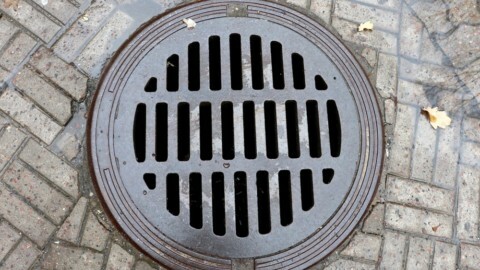 In part one of this article we looked at some of the current design practices in sewer pumping stations. This edition we take a closer look at submersible pump stations and drives. A typical submersible sewage pumping station consists of a wet well, valve chamber, inlet maintenance hole, electrical kiosk or switchroom and supporting systems. The wet well is a circular or sometimes rectangular inground reinforced concrete structure that accommodates pumps, discharge pipes, incoming sewer line with isolating valve and level sensing equipment. The wet well floor is benched to provide adequate hydraulic flow to the pumps and achieve self-cleansing. Its control volume between pump cut-in and cut-out levels should be sufficient to limit the number of pump starts per hour to no more than that recommended by the manufacturer. Wet well roof provides suitably sized openings for pumps, level sensors and personnel access. All the openings are fitted with water and gas tight covers with safety grilles underneath. A typical submersible pumping unit consists of a single stage centrifugal pump driven by an electric motor via a common rotor/impeller shaft, forming a compact and completely watertight vertical pumping unit. The motor is cooled by the pumped liquid so that no external cooling is required. The pumping units are supplied with a discharge connection (also known as duck-foot bend, discharge pedestal or discharge bend), lifting chains, guide rails, electrical power and control cables. The lifting chain and guide rails are of a suitable length to reach the access opening at the top of the wet well. The guide rail arrangement permits easy lowering and lifting of the submersible pumps in the vertical plane. When lowered down the guide rails the discharge end of the pump automatically connects to the discharge bend installed at the wet well floor. The weight of the pump facilitates a watertight seal between the two. The pumps can be fitted with an automatic flush valve for flushing of the wet well. 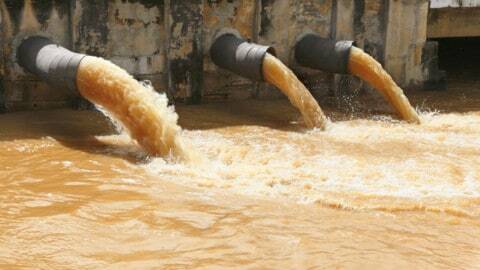 The valve opens at each pump start for approximately thirty seconds to stir up the sludge settled in the well. Preferably, the valve opening / closing operation shall be induced hydraulically by the pump flow and pressure, thus eliminating the need for electrical components and cables. Submersible sewage pumps are today available up to and above 600kW. There are a number of suppliers in Australia, but for the purpose of standardisation of spare parts and maintenance procedures, most water authorities have a single or dual supplier policy. SPS discharge valves are usually installed within an inground valve chamber. 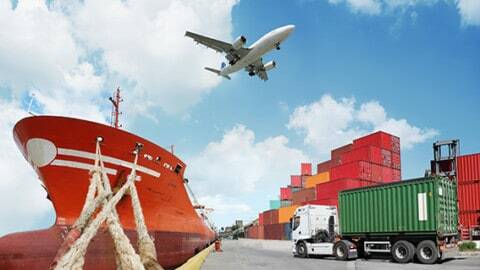 These include pump non-return and stop valves, pressure main stop and scour valves and bypass connection stop and non-return valves. In Sydney Water submersible SPSs, the chamber has open grid type cover with hinged access hatches and access through the cover to all stop valve spindles to reduce the need to access the valve chamber. Permanent ladders are provided for personnel access into the chamber when required. Non-return valves suitable for unscreened raw sewage applications include long body swing check and ball check type valves. Either resilient seated or metal seated gate valves or eccentric plug valves can be used for flow isolation. Inlet maintenance hole collects all the sewage from the upstream catchment. It is usually co-sited and positioned close to the wet well and connected to it via low and high level drain pipes. It is sized to enable personnel access and accommodate level sensing equipment, isolating flange to the high level drain pipe, and an emergency bypass pump to enable pumping into the pressure main when the wet well is isolated for maintenance or in case of SPS failure. 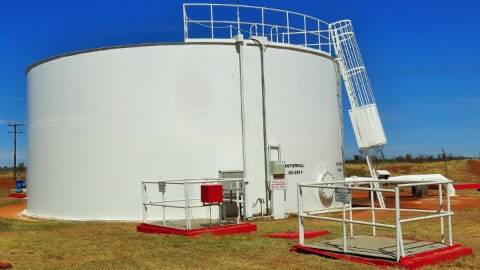 It is usually connected to an emergency relief structure (gas check maintenance hole) to provide controlled sewage overflow in case of excessive inflow or failure. The inlet maintenance hole can also be designed to collect grit to protect pumps and pressure main. All the electrical and control equipment is usually installed within an outdoor electrical kiosk positioned next to the wet well. Motors larger than 5.5 kW usually use assisted start i.e. soft starters or in special cases variable speed drives (VSD), while up to 5.5 kW direct-on-line (DOL) starters are adequate. The use of variable speed drives in sewage pumping stations is limited to situations where hydraulic control is required (e.g. 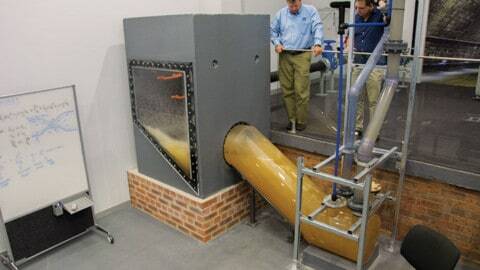 pumping directly to sewage treatment plants), where their application significantly improves the cost of pumping, where they can assist with water hammer attenuation during normal operation, or where the pumping station needs to cope with a wide range of flows and heads (e.g. staged development). VSDs above 22kW and very large motor starters usually require additional cooling or are physically too big for an outdoor kiosk and are installed in well ventilated and/or air conditioned switchrooms. SPS supporting systems may include ventilation, water supply, telecommunication, power supply, site security and access, odour control, chemical dosing, emergency storage structure etc. Water supply is provided for wet well, emergency storage structure and inlet maintenance hole wash down and general cleaning around the site. Hydrant and a vandal proof tap are usually considered adequate. A reduced pressure zone device must be provided in the water service to prevent contamination of the water supply system. Telecommunication system facilitates remote monitoring and control (SCADA or IICATS) of the asset. Where sewage septicity is a problem, chemical dosing may need to be provided to reduce corrosion and odour downstream of the SPS pressure main discharge point. Chemical dosing is often required in new catchments where due to low inflows during early development stages sewage detention times in the wet well and pressure main are excessively long. Wet well, valve chamber, inlet maintenance hole hatches and electrical kiosk doors are locked to prevent unauthorised entry and vandalism. 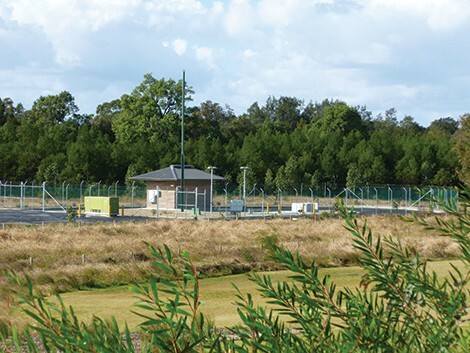 Additional site security measures, such as perimeter fencing, motion / entry sensors etc. may also be provided. The type of fencing (eg. chain link, palisade, cattle) depends on the asset location, visual appearance, community consultation and vandalism experienced in the area. SPS located within public parks are usually adequately landscaped and screened instead of fencing for aesthetic reasons.